Over the last two days I have done the cutting for the wedding quilt for June. One thousand eight hundred squares. I hope I did it right because I don't want to have to go buy more fabric. This quilt will be in neutrals and reds and should end up quite stunning. 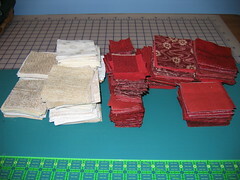 I have lots of neutrals so I cut enough of the neutral pieces to make a twin size quilt with the same pattern. But instead of reds I use a different color or maybe just scrappy. Today I will start the sewing.